If there is a suspected crack in a cylinder head, it is sometimes possible to repair these and we have many different techniques that can work. First identifying the crack (cast iron) we use a magnetic particle penetrant under a special fluorescent light to establish if the repair is viable. If so then there are several different ways to rectify including welding. 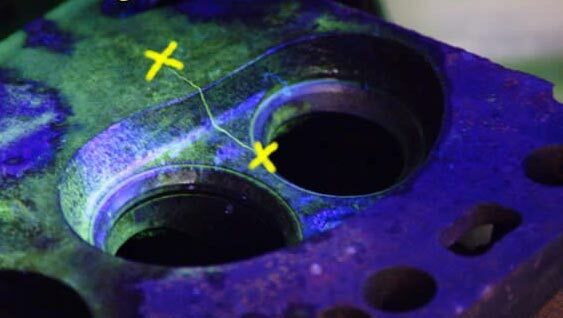 Aluminum crack testing is achieved with dye penetrant system or in the case of cylinder heads and oil coolers pressure testing. CAR-AID (66) Ltd has been established for over 40 years and in this time has gained experience in most makes of engines ranging from early vintage motors through to modern day petrol and diesel engines. As modern engines have evolved so has machining technology and here at Car-Aid we have kept up with these techniques and offer some of the best results that are available in New Zealand. Web design & hosting by 1080Design | © 2016 Car Aid 66 Ltd. Web design & hosting by 1080Design | © 2018 Car Aid Christchurch.